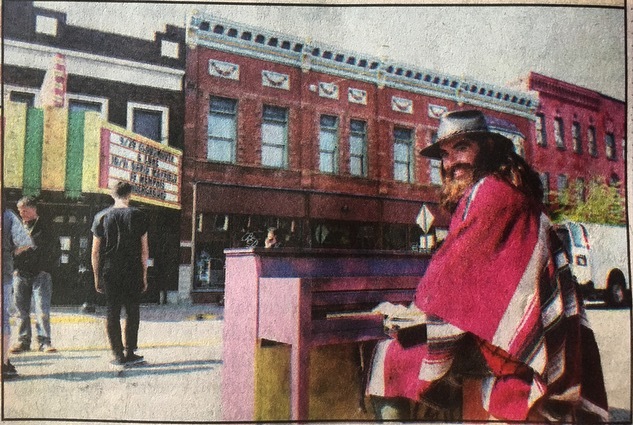 THREE RIVERS ― The historic Main Street of downtown Three Rivers served as a backdrop for an independent movie that filmed over the weekend. Write and Director Matt Whitney, of Squatchagawea Films, is originally from Constantine and introduced the film crew to Three Rivers, where the filming of a music sequence, or “the intermission of the film,” took place, Crawford said. “Matt is directing the film, starring in the film, and I am producer of the film but also act in one scene as the producer too,” Crawford said. For the past four weeks, the crew has been filming throughout Southwest Michigan. Filming is expected to conclude in another week. Crawford said Moondance will have a limited release in theaters in Summer 2019, will be screened at movie festivals, and hopes to arrange a screening at the Three Rivers’ Riviera Theatre. When requesting to shut down Main Street for filming, Crawford said Mayor Tom Lowry and other city hall employees were very respectful and helpful. “I think they were surprised with how big the production actually was. I know that Matt and I are both young guys, but it is a little more complex than any college production,” Crawford said. Nearly 25 crew members, a little over 30 cast members, and almost 30 days of filming adds up to “quite a substantial amount of money,” Crawford said. In addition to Whitney who stars as Cooper in the film, other leads included Brandon Stewart, who sang on American Idol in 2013, Carolyn Rabbers, of Wellspring/Cori Terry Dancers, Jonah Robinson, Sam Jones, and viral comedian “Action” Jaxon Trammell. Crawford began his passion of production by producing movies on YouTube with friends. He graduated from high school early to pursue the entertainment industry at 17 years old. He produced a nationwide commercial for Taco Bell and starred alongside James Franco and Nick Jonas in Goat, a 2016 Sundance film Festival selection. “Producing has always been the long game for me, but knowing that I can act when roles come around is awesome. The consistent job of producing is fun, but overall it is all fun for me. Getting the crew down here, figuring out how to shut down a whole street, I really enjoy it all,” Crawford said.